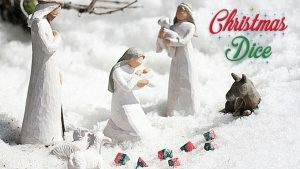 “Oh little dice of Bethlehem…” Ok so I am fully aware that is not how the song goes, but in the Christmas spirit, Halfsies Dice has just a few days left in their Christmas edition dice. And unlike most kickstarters, you can get both sets THIS CHRISTMAS! 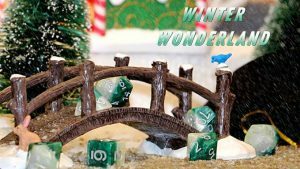 You have two choices of dice sets red berry/ dark holly green or pine green, and snow white (these are my personal favorite) and every order comes with a holiday bag. Spread some holiday cheer to the gamer in your life with Halfsies Dice. A slightly revised edition Claustophobia 1643 by Monolith has been put up on Kickstarter. 10,000 numbered pieces with no pledge manager and delivery in January (That’s two short delivery windows this week). 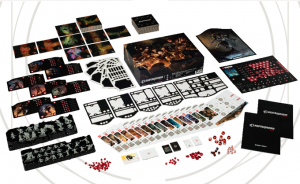 One player controls a small group of humans and the other an army of demonic creatures. The human characters are stronger, but the demon characters have strength in numbers. The game at its core is P vs. P combat/resource management. There are twenty scenarios in the book, which to me gives it solid replay value. Whether you chose to play as the humans or by demons be driven, you can sign up for your preferred faction in Claustophobia 1643. Wonderful! Thank you for sharing the Dice with your readers.